The mathematician R.L. Moore was a strong influence on Harry Lucas Jr. and his founding of EAF. 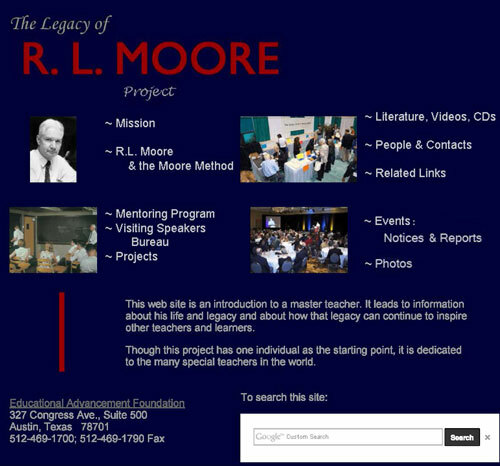 As a professor at the University of Texas at Austin from 1920 to 1969, Dr. Moore founded a branch of topology, but is perhaps best known for his method of teaching that resulted in one of the most influential schools of mathematics in modern times. The project is devoted to helping ensure that the benefits of this teaching method are available for the widest range of learners. In this respect, the project is at the core of EAF.